I spotted one of my favorite insect predators darting about on forest trails yesterday: Six-Spotted Tiger Beetles (Cicindela sexguttata). Their common name is well justified as these tiny "tigers" hunt, kill, and eat other insects. 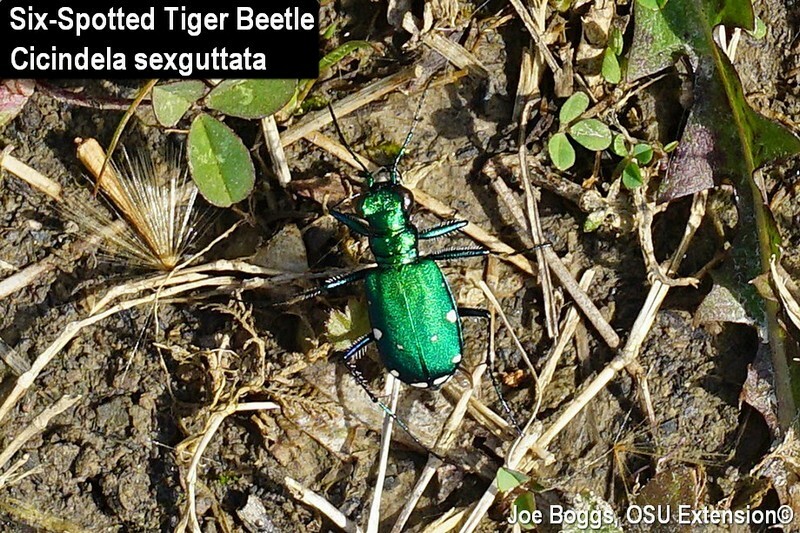 The shiny beetles are more emerald green in color than Emerald Ash Borer (Agrilus planipennis) (EAB) causing them to be commonly mistaken for the non-native borer. Indeed, these tiger beetles have excellent eyesight, quick speed, and they are agile flyers; traits that make it difficult for people to get a close look for accurate identification. Six-Spotted Tiger Beetles have a curious affinity for hanging out on woodland trails; they can certainly liven up a walk in the woods. The beetles have elongated bodies with the thorax about half the width of the front wings and abdomen. They have long legs and their bulging black eyes (the better to see you with, my dear!) make them look like they're wearing dark goggles. As the common name implies, six-spotted green tiger beetles have white spots that are arranged along the trailing edge of the wing covers, three spots per side. The spots are small and sometimes obscured by light bouncing off their highly reflective shiny green bodies. This ferocious predator sports powerful sickle-shaped mandibles that are used to grab and dispatch luckless arthropod prey; a trait that is shared with other tiger beetles (family Carabidae (Ground Beetles); subfamily Cicindelinae (Tiger Beetles)). A word of caution: these carnivores can also use their impressive mandibles to deliver a painful bite to the hand of the overly curious.